The exhibition space “Mathema for Children,” designed exclusively for children aged 4 to 10, will awaken curiosity and a thirst for knowledge in young museum-goers. 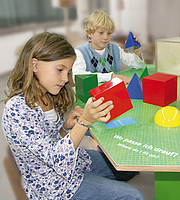 Under pedagogical supervision, they will carry out a variety of experiments and experience through play the foundations of mathematics. They can weigh numbers on the “number scale,” handle geometric forms, and find out how cars can travel with square wheels.